Some of my visitors ask for stock market advice for free. I help as much as I can, but some emails are hilarious and some impossible. Read this article to know some real interesting people. There is a lesson too. Now that my site www.TheOptionCourse.com is getting somewhat popular (I still feel a lot more needs to be done), I get regular emails for help. Let me be very frank. No person on this earth can know everything. I am a human too. Its not possible that I know everything – so its quite obvious that some emails goes into “Ask Me Anything” folder of my account for further research and later reply. My apologies if you do not get a quick reply. However whatever I know I do try to reply quick. Please also understand that my customers are my first priority and if I find time I do reply the emails asking help for free. But at the end of the day – I am the same human being as YOU. I have a family, a consulting job and of course this site which keeps me super busy. And I like that. However sometimes I get strange messages where people take me for granted. This person claims to be 51 (well could be true). Has 1 lakh in his trading account. I am sure he has saved some money, probably 10x of the cash in trading account – but wants help from me for free. Its not clear what he wants. Does he want me to give him the strategies for free or he needs money – its not clear. And his name is NOT Manas as in some previous emails. I need Rs.50,000 per month to run my house. And exactly after 28 months I need Rs.30 lac. How much money I need use as capital? I want to learn your nifty strategy whether futures or options. Currently do you have a job? And how much cash you have in your trading account? Then I did not reply as 1 lac is good to take risk with stock markets if you are slightly younger and have a steady job, but starting with 1 lac at 51 especially if you do not have a job/business is risky. 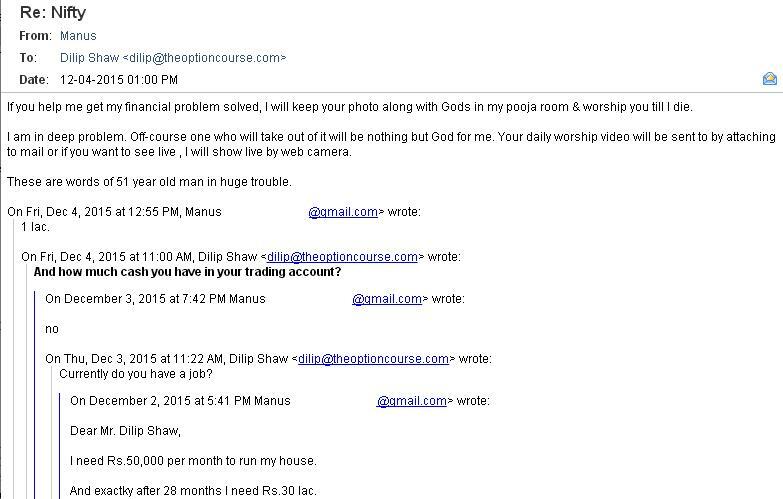 If you help me get my financial problem solved, I will keep your photo along with Gods in my pooja room & worship you till I die. I am in deep problem. Off-course one who will take out of it will be nothing but God for me. Your daily worship video will be sent to by attaching to mail or if you want to see live , I will show live by web camera. These are words of 51 year old man in huge trouble. Others can only give you advice, but in trouble it is you who can help yourself the most – no other person on this Earth can. When I was losing money trading I was in the same spot – wife pregnant, 1 Lakh personal loan, zero balance in bank accounts, sacked from Job, and on top of that whatever was left was taken away by tips providers. My back was against the wall, but Thank God, I turned it around. Who helped me? Of course my parents, friends chipped in with advice and my father-in-law paid for my wife’s delivery (Thank You Papa) – but that’s it – I had no other choice but to work hard and make sure the trouble goes away. And it did. I looked for a stable job. Any job – it DID NOT matter whether I liked it or not. At that time making money was paramount. I was willing to work day and night, nothing else mattered. Beggars cant be choosers right? In 2 days I got a good job. Then with my first salary I bought books. Did not waste time reading them. Like I was reading books while traveling to office, after coming back from office till late in the night. Of course I knew this that if I am losing money, there are others losing money too and so I made this website to help the retail traders trade to make a profit. But then I hope you understand I have my limitations too. If you think someone from the skies will come and take all your troubles away and do nothing – hell you will get into more trouble. At at 51 if someone thinks like this then its is quite surprising. This person wants help but has set a time limit for me to reply back. How interesting is that? I am planning to adopt delta neutral strategy trading in Nifty options from next series. But instead of shorting any option and hedging it by buying the same option(of course different strike price), I am planning to short both put and call options at a far away price i.e. if Nifty at 8300 shorting put of 7900 and call of 8700. Also readjusting my positions according to movement of Nifty to earn full or maximum premium at or near expiry. Please inform whether I am on right track or do I have to take some extra precautions. Please reply before 30th October(start of November series) Thanks in advance. See how he is to asking me to reply back before 30th October. He is not my customer. Dilipji sometimes you send regarding vix down or up and your strategy worked for 3 to 6% like that. 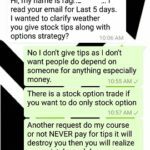 Its alright but you did not told about which call or put options buy rate and sell rate please next time mention the options rate also. If you are not willing to learn – no one can help you. No tip provider can ever make you rich. Can you help me with regards to the below query, also can u share your contact details as I wanna learn more about Options. With regards to Option I have a question on below mentioned chart. In this chart Nifty 8300 call option on 1st of June shows settle price of 555.05, at this time there is no contract traded and also open interest is zero. Question is how exchange has arrived with this price when there is no one trading. Ok the question is good but silly if an option teacher is asking. Even if not traded an option will have some value. Ask and bid are based on the option premium provided by the market makers. So an option will have some value even if no one is trading. He has also NEVER traded options by the way. 🙂 He called me and told me that. Here are some other interesting emails I would like to share. I am not attaching a screen-shot as it is not required. I am 63 year old and retired from Govt. Service in the post of Accounts Officer. I have started trading since 2012 and lost nearly above 40,00,000/-( Forty lakhs) My retirement benefits have gone with in the period of 3 years. Please help me in recovering my loss at least 20% or 25%. For a long time from 2005 i am trading in this market and lost RS 12 Lakh in this market by trading option and futures. I have already tried for more than 24 tips provider at last i had faced loss with them ultimately. One day i saw your advertisement on a website and replied. I am watching your mails for more than two months but i could not understand the way by which i can get back my money back which i have lost in this market. I have only Rs 2500/- in my trading account but having holding of stocks valued RS 130,000/-and for this i can get exposure of the same amount for just 5 trading days only for a single trade. My account is with India Infoline and Brockrage is Rs. 80 for option per lot one side and 5 paisa intraday RS 150 for future one side. Now please suggest me is it possible to trade any option strategies in this kind of situation ? I have stopped trading since six months as i have lost my confidence and guts to loss. I am 55 year old with practically small savings and on the verge of retirement. Positive thing is that my children are well settled and can look after themselves and can provide only basic necessities of my life. I have got a sickly wife whose medical expenses are 2.5 lacs per annum and which is my 50% of my annual income. I can offer a risk money of 1 lac for building my retirement corpus which is 3 years away from now. I am interested in options trading and had been learning a lot about them, but I had not taken the plunge. Suggest how you can help me and also approximately how much retirement corpus I can build in 3 years time with 1lac I am going to invest now. Please explain to me in detail. I may be able to spend at least 2 hours for trading every day. Thanking You. I am sorry if this email hurts anyone – but what I am trying to say through this article is “You Are The Only One Who Can Help Yourself In Trouble”. So just get up and learn to work hard. There is no free help. You either pay money or your pay through your time. Its your choice – but hard work you must do. These guys are not thinking while paying to wrong tips providers, but now they want the tips from real person like you for free even the charges of yours is very very less. 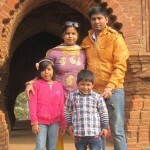 Dilip you are the great person on this planet in this field, I have not discovered yet any like you. one simple one sentence tip (do not buy at market price) itself saving much money than your fees, really i have not heard from any one. Thanks Joseph for the kind words. Yes very true they will pay thousands to tip providers and lose, but cannot pay a small sum to learn to trade on their own because it requires hard work. Correct there, Options are a hedging tool and people are misusing it. This is the reason my emphasis on hedging through this website. If people understand its great – but unfortunately they get lured by unlimited profits by buying options – and here is where all problems begins. But its wrong to say trading option is not ethical, because those who know how to use them are making good returns from the stock markets. It is those who have no knowledge about them are losing. So it is the responsibility of SEBI, NSE, BSE and other stock exchanges to create awareness among traders. That I see missing. BIG WORLD WITH MEAN MENTALITY. “Belief is a poor substitute for knowledge”…. Please understand this as soon as possible. Every trader learns this, some sooner some later. But few can implement it. Make rules & worship them literally. If you make less following rules its still better than making big occasionally by breaking rules & other times doing catch up job..
>> Belief is a poor substitute for knowledge..